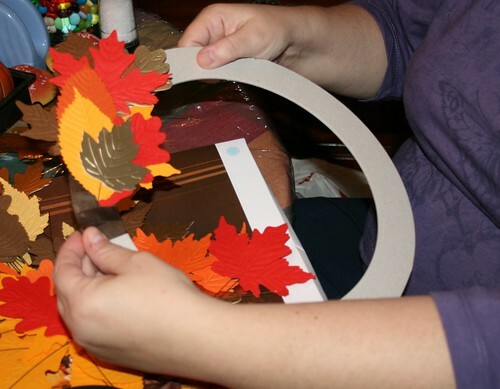 Me assembling Leaf Wreath, originally uploaded by DianthusMoon. 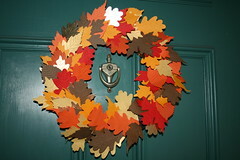 Though my day didn’t really go as planned, I finally did assemble this Martha Stewart leaf wreath that I had a while. The leaves are so nicely made and it helped my nerves too. Brian was home and he to the doctor (with a note from me). He seems to have issues every few months, especially if I have issues (last week the bp issue). This time he is getting blood work and maybe seeing a few specialists. His appetite is great, though he still has an issue with his sense of taste and smell (was told a virus may have taken most of them away). I think his stress level is very high and Sean and I are pulled into that. I have to get myself checked out soon. I did get a ‘normal’ mammogram report-yes! I was happy, but still hope the PAP and the blood pressure issue will get resolved or at least helped. Then I made my two collages, a catch up one as Sean and I had gone out for him to get tires yesterday (I went along for the ride) and when we got to Wally World, the place was in lock down and fire engines were there! We had a similar experience in July when we went to see Avatar! What gives? We went to the Christiana Mall in Delaware (where Wally World was) and ate in California Pizza Kitchen. I didn’t eat pizza, but had a fish taco. Sean had ham and pineapple pizza. We did a little shopping. I swear that those specialty clothing stores only get a handful of skinny shoppers! I wanted to stop at Kohl’s to see if they had the slacks I really liked and they had one pair in gray. A saleslady said I could use the interactive kiosk and shipping would be free! So I will have 2 grays and 2 blacks for only $72! I know if I only kept the 2 pairs I got a few weeks ago, they would be worn out in no time. 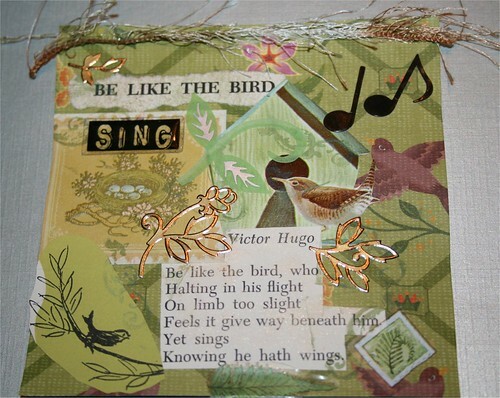 I flipped open a kid’s book to this Victor Hugo poem and it was perfect. I like how all my olive greens go together. 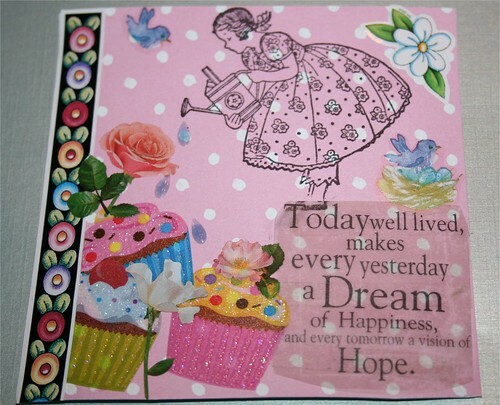 I wanted to use another rubber stamp I purchased last month and this one is just too cute. Do you like her cupcake garden? I picked the quote about happiness as I sure need a hefty dose of it ‘right this very minute’. Stuff is a bit rocky here. It is so very worrisome when there is stress layered with health issues. I’ve been struggling with both of those recently. Your collages are very pretty! My husband and I just tried a Hawaiian pizza this past weekend and I was pleasantly surprised at how good it was.